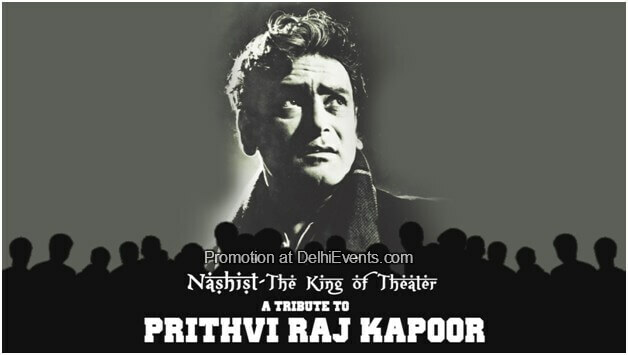 Event Description : TALK : In this month's Nashist, Impresario Asia pays its humble tribute to one of the icons in Indian theatre and cinema, Prithviraj Kapoor. The talk this month showcases the unique and elaborate contribution of stage and screen icon veteran Prithviraj Kapoor, father to Raj, Shammi and Shashi Kapoor, and his exemplary role in the freedom struggle through Prithvi Theatre with a team of highly accomplished artistes like Zohra Sehgal, Sajjan and numerous others. Sanjeev Upadhyaya - A leading journalist and a well known face at DD, will anchor the evening through dramatized readings, audio visual clips and a panel discussion. Dramatised reading of excerpts from writings on Prithvi Raj Kapoor by artistes of Impresario Asia.